You’ve signed up for your very first text message marketing campaign, and now you’re ready to rock n’ roll. Hey, we don’t blame you! We’re super passionate about our service, and want you to be too. 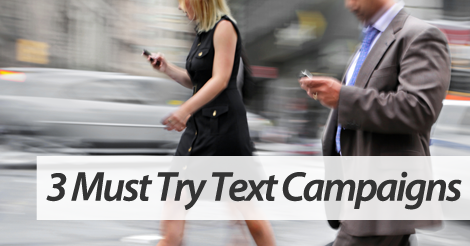 Start off by trying your hand at these three text message marketing campaign ideas. This is probably the best way to quickly grow your list. Pending the value and appeal of the grand prize, you could add hundreds, potentially thousands of new subscribers. Make sure your grand prize is irresistible and holds a mass appeal. Pictures sell. You can’t argue with this simple fact. Visual marketing is where it’s at in 2016. Now, if it doesn’t make sense or isn’t applicable, don’t include an image for image’s sakes. But, if you’re trying to sell a product that would benefit from some visual representation, by all means – give MMS a try. This text campaign is applicable for brick and mortar stores as well as ecommerce retailers. If you run a physical location, fire out a show this text mobile offer. If you only operate in a digital environment, give subscribers a promo code to enter at checkout. Either way, firing out unique, limited time only mobile offers is a great way to grow your list and increase offer redemption. You’re rewarding subscribers for their loyalty, which is never a bad thing. Partner up with top text message marketing service, SlickText.com. Give us a buzz today at 1.800.688.6290 to learn more, or head over to the pricing page and sign up for a free plan. The key to text message marketing success? Knowing, understanding, and embracing the ins and outs of our platform. We have dozens of unique features that help you grow your text message marketing list at a rapid rate. On top of that, our educational tools are second to none. After signing up, comb through our learning center, and familiarize yourself with text message marketing best practices.